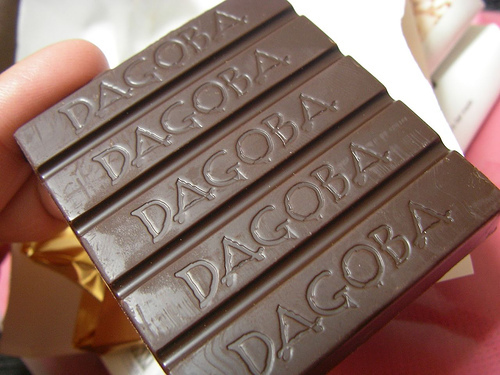 Dagoba fair trade chocolate. Photo by jetalone. Many chocolate lovers consume and enjoy chocolate without ever thinking about where it comes from or how it was produced. However, there are many issues surrounding the production of chocolate that are important for consumers to be aware of, from the labor used to harvest the cacao to the pesticides used on the trees. Here’s a look at some of the issues surrounding chocolate production and what you can do to ensure you’re buying chocolate with a trouble-free history. Cocoa beans are harvested mainly in developing countries where the political situation can be shaky, to say the least. The Ivory Coast produces 30 to 40 percent of the world’s cacao, and is still one of the worst offenders when it comes to labor practices. Despite the Cocoa Protocol, established in 2001 as an audit system for African governments to help monitor child labor, the country’s civil wars and disputed elections have made it difficult to track the worst offenders. Large chocolate manufacturers such as Hershey’s and Nestle came under fire earlier this year for using cacao from Ivory Coast farms that may employ child labor. Cocoa trees are highly susceptible to disease and pests, so the use of pesticides is widespread. Organic chocolate means the chocolate is free of pesticides, synthetic fertilizers and GMOs. Luckily, organic chocolate is becoming easier to find locally, with Whole Foods and Trader Joe’s both carrying USDA-certified organic chocolate. Raw organic chocolate, while much less sweet than the non-raw kind, is gaining in popularity among the vegan and raw food set. One of the benefits of buying raw is that the cacao is heated at very low temperatures, using only a very small amount of energy compared to non-raw chocolate production. The number one way you can be sure your chocolate has been harvested in a sustainably, without the use of slave or child labor, is to look for Fair Trade certification on the packaging. The concept of Fair Trade began in the 1940s as a way to help poor communities sell their products to more well-off ones. It has since evolved into an organization that partners with companies that provide workers in developing countries a living wage, are anti-slave and anti-child labor, and that use sustainable environmental practices. Fair Trade USA provides a list of certified chocolate companies to help you make informed buying decisions. Where your chocolate comes from is important, especially if you’d like to avoid questionable labor practices. How can you tell where it comes from? Besides looking for a Fair Trade label, seek out single-origin chocolate. Single-origin chocolate comes from a single region or farm and is labeled as such. By purchasing this type of chocolate, you can ensure that you’re buying chocolate from a country with strict environmental regulations and laws against child and slave labor. Editor’s Note: Do you pay attention to where your chocolate comes from? What are your favorite brands of single-origin, fair trade, raw and organic chocolates? Share your thoughts in the comments! Kate Steffens is a pastry chef, writer, DJ, artist, designer and all-around Renaissance woman. She is a graduate of the California Culinary Academy and the University of Texas at Austin. She runs the rock-and-roll chocolate company, Straight Outta Chocolate. When she's not elbow deep in chocolate, you can find her reading, gardening, working on art projects and listening to old records.